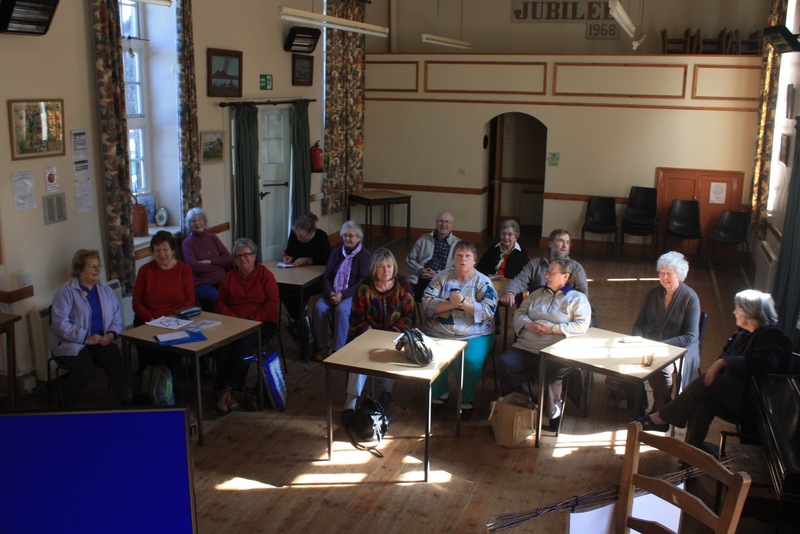 On Wednesday 23rd March, Hugh gave a talk about the farm in St. Just Women's Institute Hall to the University of the Third Age (U3A), which went down well, with 14 people in attendance. 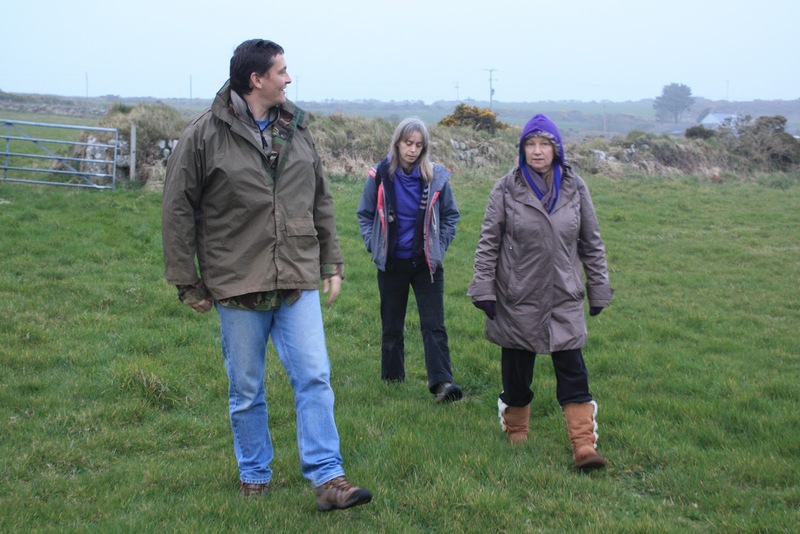 One thing that came out of this talk was the realisation that very few people in the area know that Bosavern Community Farm, rather than being paid by Cornwall Council to run the farm on their behalf, actually pays a commercial rent to the council, all of which has to be raised through farm sales, fund raising, and external grants. U3A members during the talk. We are now hoping to organise a farm-tour and picnic for members of St. Just U3A in June. Thanks to U3A for inviting BCF to address them, and thanks to several of the members who sponsored chickens on the farm. The regional gathering of WWOOF (Willing Workers On Organic Farms) hosts for the south-west of England was held at Bosavern Community Farm yesterday, Saturday 26th March. 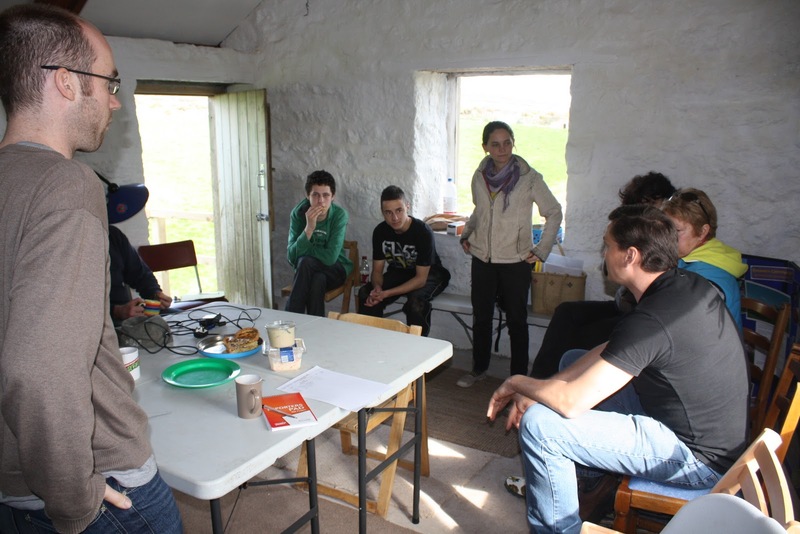 Although the turn-out was poor, with only two other hosts able to attend (the weather is too good to stop work these days! ), the day was a positive one and enjoyed by all. Gathering in the newly refurbished Hive. 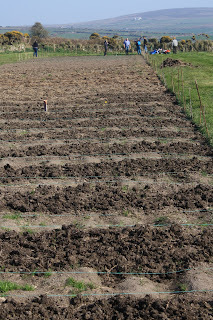 The gathering continued with everybody working together to prepare two beds for onions out in the vegetable field, on a gorgeous afternoon, with 16 people quickly getting 2 beds weeded and dug over. Followed by a few well-deserved beers back in The Hive. 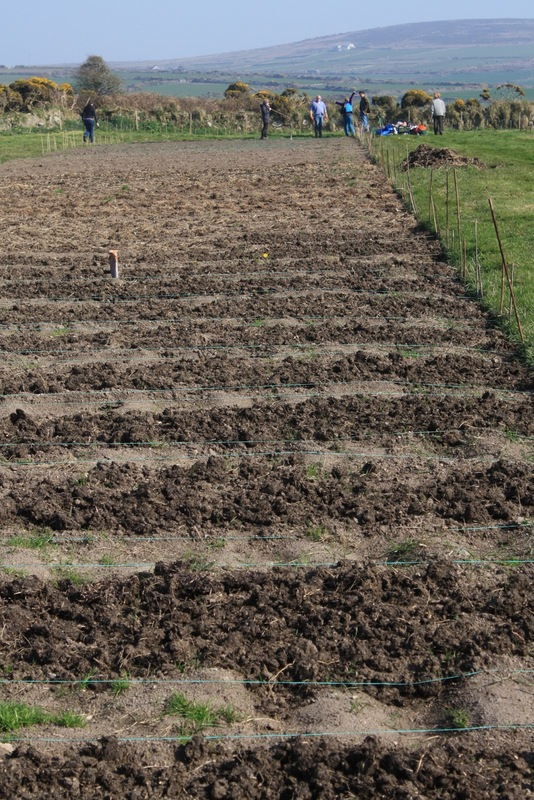 A great cooperative effort preparing onion beds. Many thanks to Abby for organising the day, Charlotte for coming to inspire us, and everybody else for turning up and helping make the day so fruitful and enjoyable. 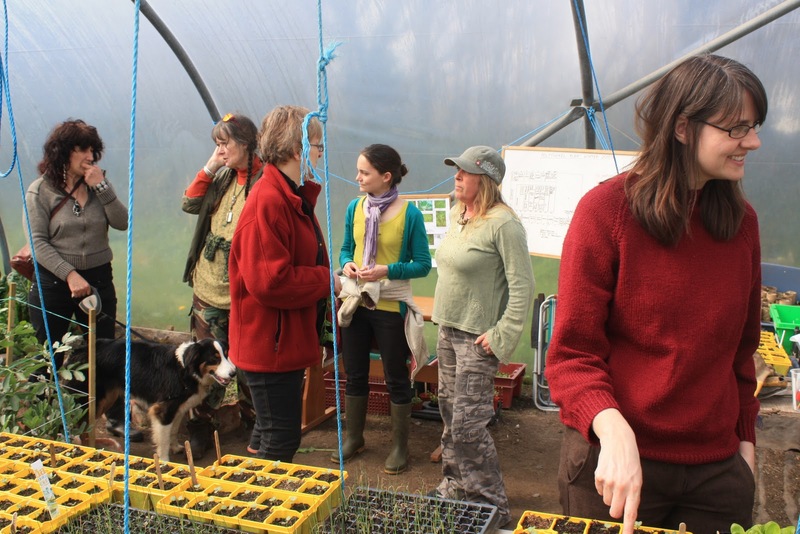 On Thursday 31st March members of the Bosavern Community Farm team will be travelling up to The Community Farm in Bristol on a fact-finding mission, so regrettably we are having to cancel our regular Thursday volunteering session. After eight volunteer sessions totalling 170 person-hours, we have finally succeeded in filling our potato strip with potatoes! This is a fantastic achievement, only possible thanks to the teams of volunteers who came along throughout March. 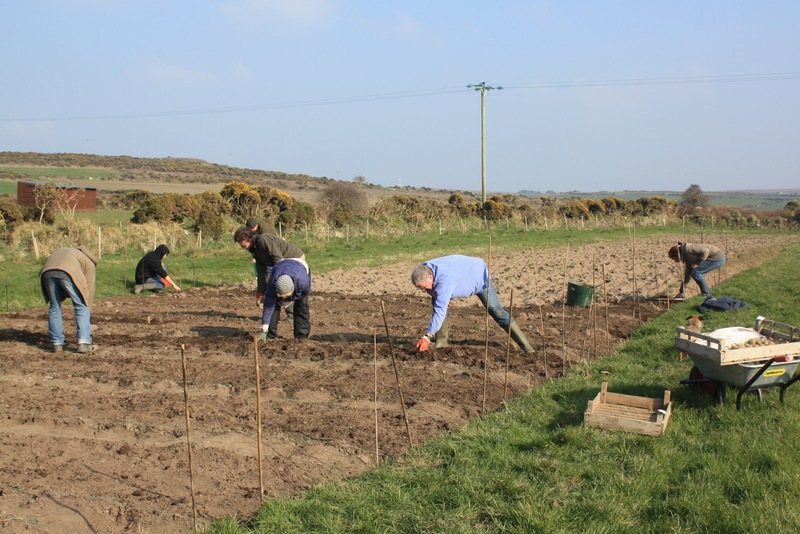 Apart from ploughing the strip by tractor on January 1st, all the rest has been done by hand, using rakes, forks, trowels, trugs, and tape-measure, with a total of 190kg of seed potato going into the ground. Almost at the end of the potato strip! The potatoes, when harvested, will form the foundation of our vegetable-boxes when we start producing them later in the year. 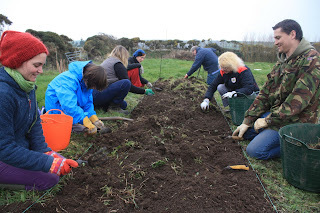 We have planted 6 different varieties of potato, namely Pentland Javelin (early earlies), Maris Peer (second earlies), Cosmos, Charlotte (salad potatoes), Ambo, and Sarpo Axona (blight-resistant maincrop potato). We'll be trialling which performs best on the farm, which produces the highest yield, which sells best, and of course which tastes best. Putting the very last potato in the ground. 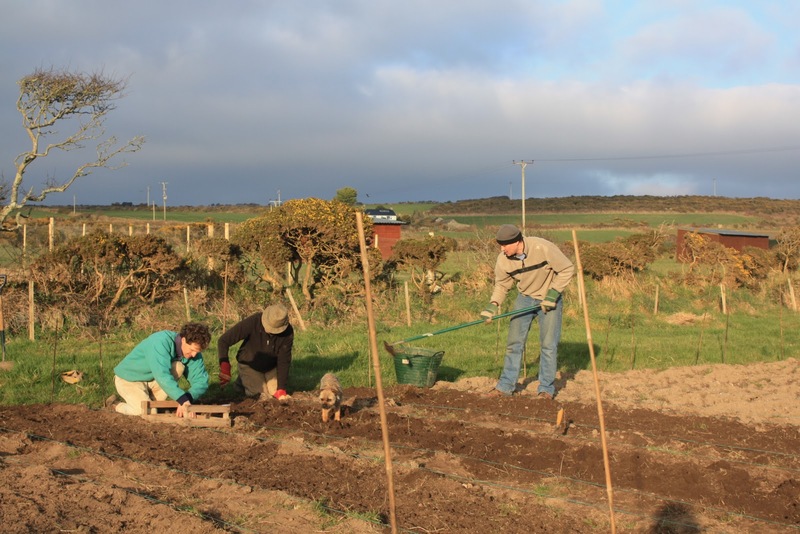 When we first began planting potatoes on March 2nd, the far end of the strip seemed very far away indeed, but we edged closer every session, until on March 24th we popped the last potato into the last hole of the last bed, and headed back to the farmhouse kitchen for a deserved cuppa. The celebratory beer arrived two days late, but was worth waiting for! Chicken fencing with Wild Penwith Volunteers. 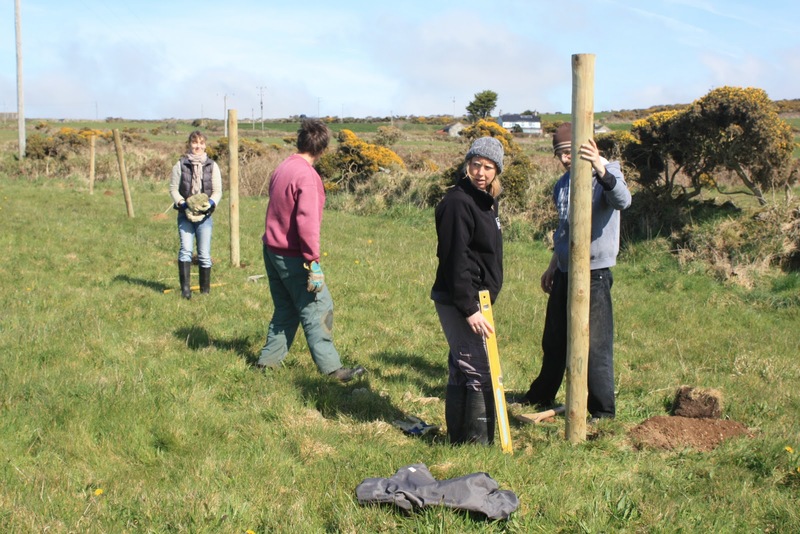 Thanks again to the Wild Penwith Volunteers, organised by Cornwall Wildlife Trust, who came to work on the farm for a day on Tuesday 22nd March, this time to begin construction of the new chicken runs. 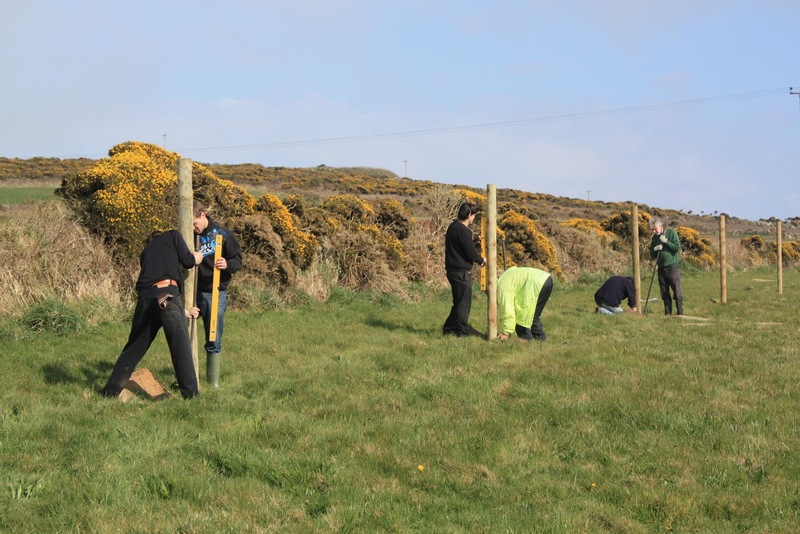 Although not strictly a "conservation" task they were keen to add fencing to their list of skills, and as always it's amazing what a team of enthusiastic people can accomplish in one day. Strainer posts gradually working their way around the field. Wild Penwith volunteers digging post-holes. Since November we have had 50 chickens on the farm, who are now producing about three dozen eggs per day, and we are finding it difficult to supply the demand for them! So our plan is to have at least 100 more laying hens on the farm sometime in May, which means a lot of fencing work beforehand. Each flock needs two runs, so that they can be rotated between the two, allowing the grass in each to recover before the hens return. So we are now building fences for our current flock's second run, plus sufficient runs for two more flocks, to increase our egg production. 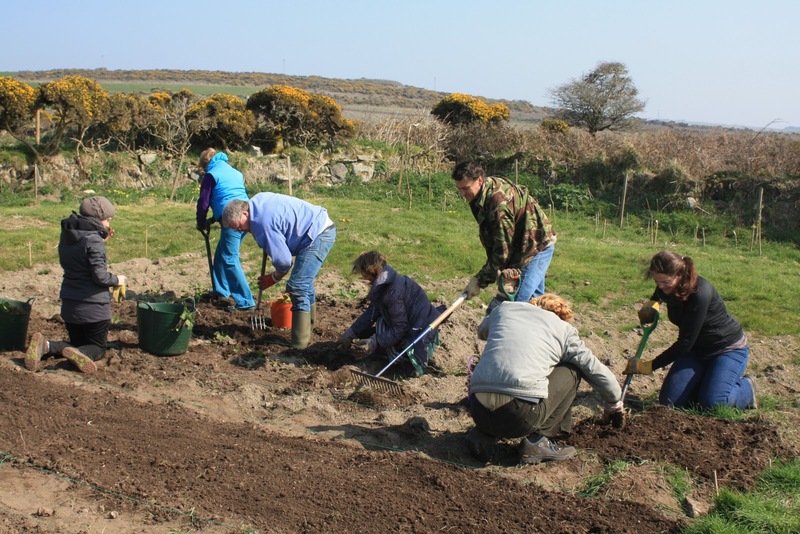 Throughout April we will be interspersing chicken fencing sessions with vegetable bed digging sessions, so please come along and lend a hand! Collecting stones to anchor the posts with. 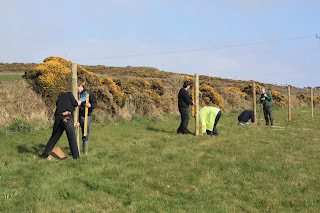 Also thanks to pupils of St. Just Primary School who came down to the farm to measure out where the posts should go beforehand, as part of their maths class. 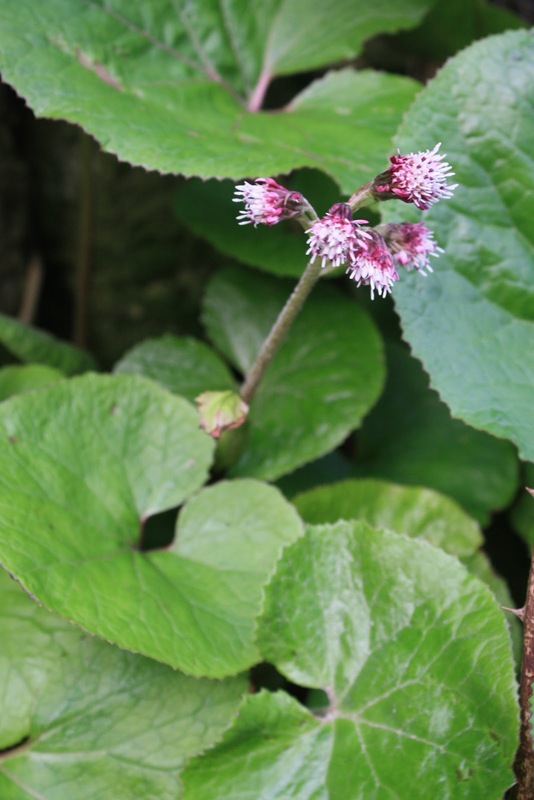 Wildflower Discovery Walk - to be held Weds 13 April, 6pm. The next wildflower discovery walk will be held at 6pm on Wednesday April 13th, meeting at the market cross in the centre of St. Just. 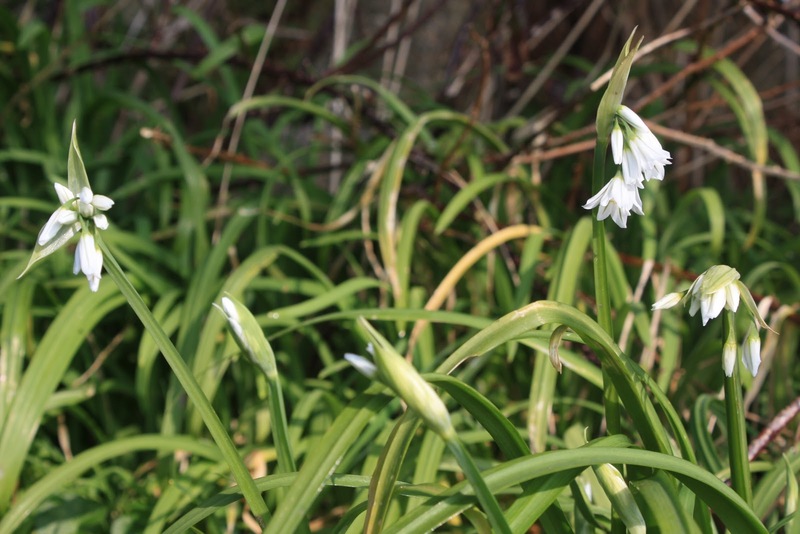 We'll walk across fields to the farm, search for wildflowers, and finish with a chance to buy fresh organic produce from the farm. Donations for the walk are welcome. 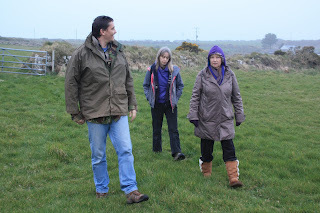 Yesterday, three people came to the farm for our Wildflower Discovery Walk, as advertised in the Cornishman. This meant a nice small group and a lot of interaction! Although not many flowers are poking their heads out this early in the year, we found quite a few, and identified others from their leaves and last year's flower heads (or fern fronds - and even the "yellow brain fungi" on gorse stems). Most were found in the far top field, where the most pronounced south-facing slope on the farm is. Butterbur - Petasites hybridus - because the leaves were once used for wrapping butter. 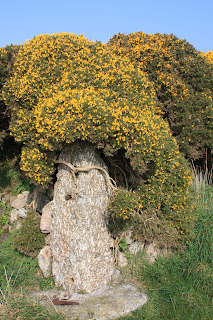 Gorse - Ulex europeus - engulfing a granite gatepost. 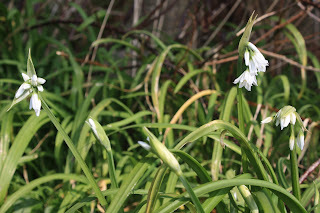 Tri-cornered leek - Allium triquetrum - strong onion-tasting leaves. 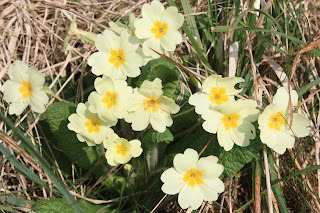 Primrose - Primula vulgaris - whose name in Spanish, primavera, means "spring". 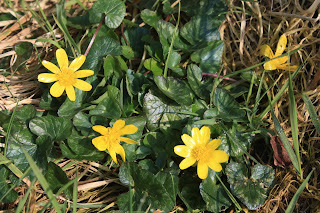 Lesser celendine - Ranunculus ficaria - a member of the buttercup family. Kent, Roz and Sonya out hunting for wildflowers. 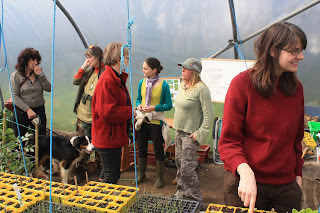 Many thanks to Maud, our latest wwoofer, who left us on Monday after two weeks helping on the farm. 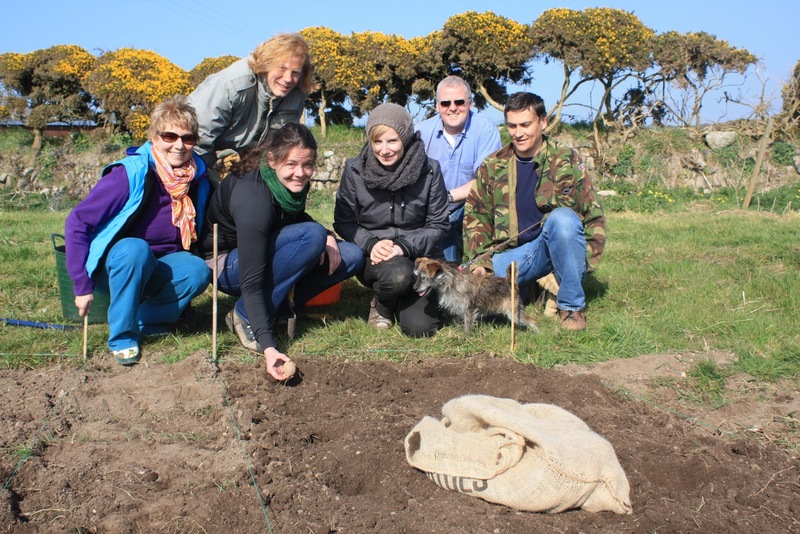 Special thanks for getting up at 6am to help harvest salads for Pendeen Farmer's Market on Saturday 5th, plus of course all those potatoes planted and manure wheelbarrowed! Potato Planting Week - the photos. January 1st, Dan ploughs the potato strip in preparation. 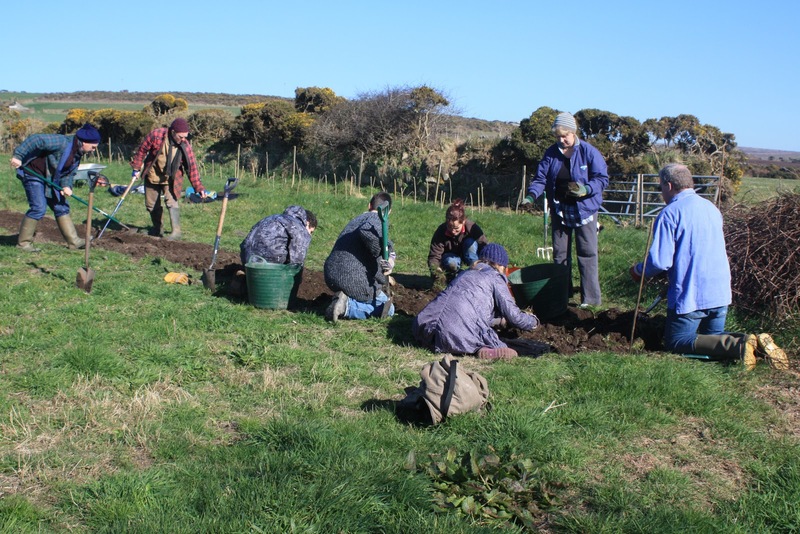 Wednesday, a small but dedicated team of volunteers planted 5 beds of Pentland Javelin early potatoes. Thursday, a big bunch of volunteers planted 30 Autumn Bliss raspberry canes. Friday, more volunteers planted 11 beds of Maris Peer and Cosmos potatoes. 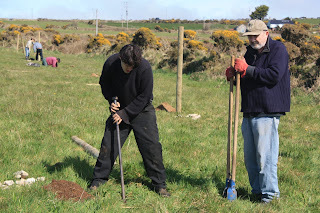 Saturday, we finished the raspberries by planting the final 20 canes. 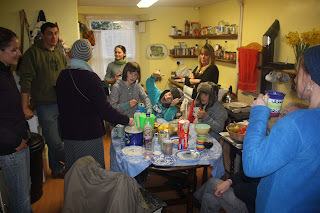 Celebration - pancake day came early as we rounded the week off in the farmhouse kitchen. Wednesday 2nd, 1 till 5pm - planting potatoes. Thursday 3rd, 10am till 3pm - usual Thursday session, planting raspberries and jerusalem artichokes. Friday 4th, 1 till 5pm - planting potatoes plus harvesting for Pendeen Farmer's Market. Saturday 5th, 1 till 5pm - usual Saturday session, cleaning out the chickens and other tasks to be confirmed (probably more planting!). 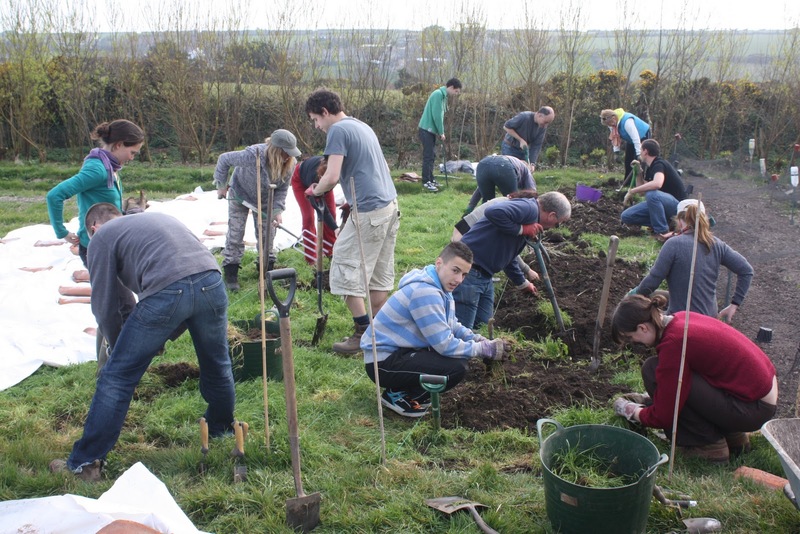 We look forward to seeing as many people as possible to lend a hand on the land. If interested please just turn up at the times above, or give Hugh a ring on 01736 788454.